Do you have any idea where you focus your attention and the result that focus produces in your life? Most of us are distracted. Lots of things demand our attention. You know what I meant. You hear the pinging noise of email coming in and Facebook messages and the beeping from your phone when a text comes in. You have the radio, TV, videos, and people talking at you on websites. Family members and your boss ask things of you, and there are the everyday emergencies—a sick child, the car doesn’t start, or your best friend’s mom dies. Many things demand—and get—your focus. Noise comes at you constantly. It’s no wonder you feel distracted from what really matters. You have to focus on the positive future you want to create. To create anything in your life, you have to focus on what you want and where you’re going. You have to focus on the positive future you want to create. Is it on a negative potential outcome? When you focus on a potential situation that isn’t what you desire, you feel fear and anxiety. Maybe you are focused on the past. Maybe something happened this morning that made you angry. Now can’t get it out of your head. Your attention is focused on something you can’t change, which also produces stress and negative feelings. Instead, focus on the positive future you want to create. That’s how you achieve positive future results. To create what you want in your life – whatever that is—you can’t focus on the past or on an unwanted future. In stead, focus on is the future you want to create. Possibly you want to create a business, a relationship, a New York Times bestselling book, a new painting, a new home, or a hobby. The what of what you create doesn’t matter. You have to focus on creating it. More specifically, focus on having what you want to create; don’t focus on not having it yet. Most people are keenly aware of what they don’t have yet. That focus creates more of what they don’t have rather than what they do have (or want to have). 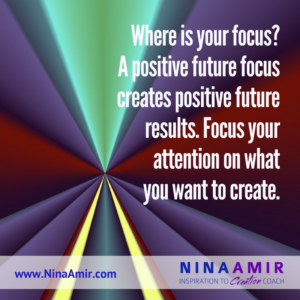 A positive future focus puts your attention on where you’re going and what you want to create, rather than where you’ve been and what could potentially go wrong or on what you don’t have. The key is to maintain the positive future focus. Focus on having what you want to create; don’t focus on not having it yet. You can keep your attention focused on what you want to create in a variety of ways. Creative visualization provides a fabulous tool for creating the results you desire. 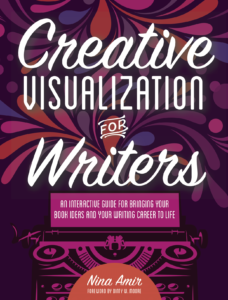 I write about visualizations in my new book, Creative Visualization for Writers, but it works for anyone, not just writers. When you employ creative visualization in your life, you consciously and deliberately imagine your positive future. Whatever it is you want to create, you focus on it once a day or more. Whether you want a contract with a literary agent, a painting hanging in a gallery, 50 people buying your new product, marriage, a baby, visualize it as if was already part of your life or experience. Use your imagination creatively to see in your mind’s eye where you’re going and what you’re going to create. More than that, imagine yourself having already arrived and created what you desire. As you see it in your imagination, feel what it is like—not what it will be like. Be there, in the moment. 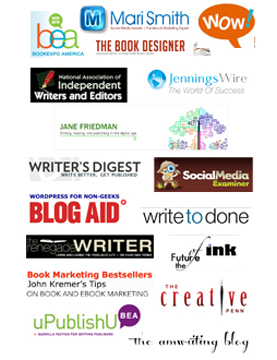 Lots of people, authors, and experts suggest employing creative visualization. I was at a personal growth event recently and visualization was suggested as a way to move into the version 2.0 of myself I want to create. Athletes use visualization; they visualize themselves crossing the finish line and getting over tough spots in their races or competitions. You may have noticed the trend towards adult coloring books. They are in all the stores. Coloring for adults is relaxing and focuses attention in the moment. Don’t just color mandalas or flowers. Color what you want to create. For example, in Creative Visualization for Writers I have included coloring pages that related to things writers want to create—bestselling books, contracts with publishers, raving fans, and completed manuscripts. As you color, your focus is on that activity. But if you color a picture of your book on a bookstore shelf, you train your mind on that eventuality. Imagine what it would feel like to have created your desire. Another way to focus your attention on what you want to create involves writing or saying affirmations. You even can write the affirmation on the top of the coloring book page. So if you are coloring a page that has a bestseller sign on it, you can write, I am now a bestselling author. It’s a good practice to write affirmations in the morning and evening. You also can recite them aloud. 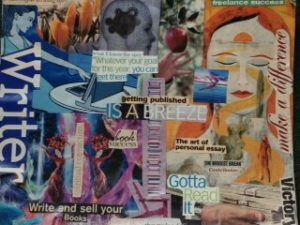 Create a vision board, a collage of pictures that remind you of what it is you want to create. You could have a collage with pictures about your dream house, relationship, or job, for instance. I once saw a video of someone who put his dream house on a vision board. He packed that vision board into a box when he moved and never unpacked it until many years later…when he discovered he had purchased that exact house and was living in it. Cut out pictures from magazines and put them on a piece of poster board. Then put it up somewhere where you can see it and focus on it. Look at the pictures and generate the feeling of having the things on that board. With visualization, affirmation, vision boards, or coloring, get to a feeling place. Imagine what it would feel like to have created your desire. Don’t think, Wow! Wouldn’t it be great? That places your focus on I don’t have it yet. Instead, focus on I have it. It is so great! I live in this fabulous house by the ocean. Every morning I see the sunrise and go for a walk on the beach. Living in this house is so relaxing and peaceful and makes me more creative. As focus your attention on what you want to create you will generate energy that helps you move towards it. You’ll constantly find and make opportunities to take action that helps you create. Make the time to focus your attention on what you want—even if it is just for two minutes per day. In the time you have, focus your attention on what is most important to you—the creations you want to bring into the world. Nina! I have joyful tears flowing from my willing lacrymal. I will write it down and send to you when my thoughts are together with the record in progress of all that is happening in my life since I met you & Alinka, Derek Murphy, Brian Cohen, Rebecca from AWAI and a few others. The timing & content of your emails that I am led to read & respond is nothing short of a miracle in this journey of mine. You will see and agree. Later! 🙂 Much love, thiaBasilia.